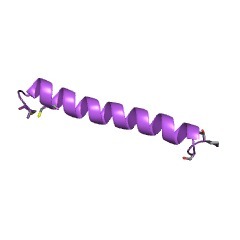 This family is formed by calcitonin, the calcitonin gene-related peptide, and amylin. They are short polypeptide hormones. Calcitonin [(PUBMED:3060108)] is a 32 amino acid polypeptide hormone that causes a rapid but short-lived drop in the level of calcium and phosphate in the blood, by promoting the incorporation of these ions in the bones. This is the alpha type. 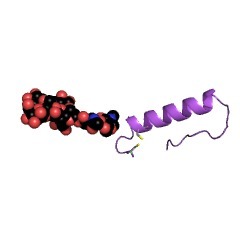 Alternative splicing of the gene coding for calcitonin produces a distantly related peptide of 37 amino acids, called calcitonin gene-related peptide (CGRP), beta type. CGRP induces vasodilatation in a variety of vessels, including the coronary, cerebral and systemic vasculature. Its abundance in the CNS also points toward a neurotransmitter or neuromodulator role. 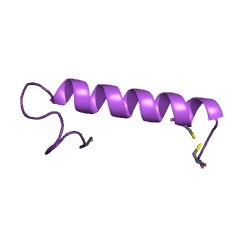 Islet amyloid polypeptide (IAPP) [(PUBMED:2407732)] (also known as diabetes-associated peptide (DAP), or amylin) is a peptide of 37 amino acids that selectively inhibits insulin-stimulated glucose utilisation and glycogen deposition in muscle, while not affecting adipocyte glucose metabolism. 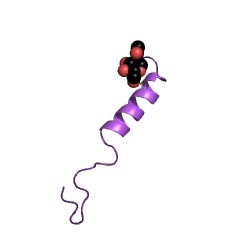 Structurally, IAPP is closely related to CGRP. 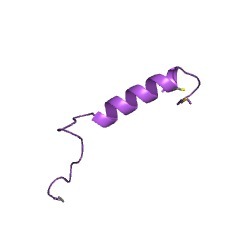 Calcitonin receptor-stimulating peptide 1 stimulates cAMP production via the calcitonin receptor. Two conserved cysteines in the N-terminal of these peptides are known to be involved in a disulphide bond. The C-terminal residue of all three peptides is amidated. 'C': conserved cysteine involved in a disulphide bond. 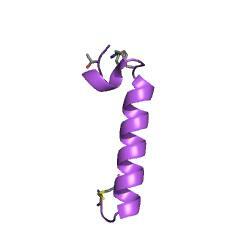 There are 1064 CALCITONIN domains in 1059 proteins in SMART's nrdb database. Taxonomic distribution of proteins containing CALCITONIN domain. This tree includes only several representative species. The complete taxonomic breakdown of all proteins with CALCITONIN domain is also avaliable. Click on the protein counts, or double click on taxonomic names to display all proteins containing CALCITONIN domain in the selected taxonomic class. 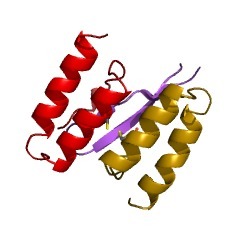 The calcitonin family of peptides. Solution structure of human calcitonin gene-related peptide by 1H NMR and distance geometry with restrained molecular dynamics. The structure of human calcitonin gene-related peptide 1 (hCGRP-1) has been determined by 1H NMR in a mixed-solvent system of 50% trifluoroethanol/50% H2O at pH 3.7 and 27 degrees C. Complete resonance assignment was achieved by using two-dimensional methods. 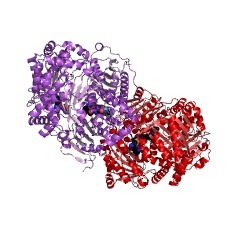 Distance restraints for structure calculations were obtained by semiquantitative analysis of intra- and interresidue nuclear Overhauser effects; in addition, stereospecific or X1 rotamer assignments were obtained for certain side chains. Structures were generated from the distance restraints by distance geometry, followed by refinement using molecular dynamics, and were compared with experimental NH-C alpha H coupling constants and amide hydrogen exchange data. 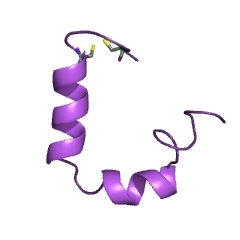 The structure of hCGRP-1 in this solvent comprises an amino-terminal disulfide-bonded loop (residues 2-7) leading into a well-defined alpha-helix between residues 8 and 18; thereafter, the structure is predominantly disordered, although there are indications of a preference for a turn-type conformation between residues 19 and 21. Comparison of spectra for the homologous hCGRP-2 with those of hCGRP-1 indicates that the conformations of these two forms are essentially identical. Solution conformation of salmon calcitonin in sodium dodecyl sulfate micelles as determined by two-dimensional NMR and distance geometry calculations. The 32 amino acid hormone salmon calcitonin was studied at pH 3.7 and 7.4 by two-dimensional NMR in sodium dodecyl sulfate (SDS) micelles at 310 K. The spectrum was fully assigned, and the secondary structure was obtained from nuclear Overhauser enhancement spectroscopy (NOESY), 3JHN alpha coupling constants, and slowly exchanging amide data. Three-dimensional structures consistent with NMR data were generated by using distance geometry calculations. A set of 260 interproton distances, derived from NOESY, and hydrogen-bond constraints, obtained from analysis of the amide exchange, were used. From the initial random conformations, 13 distance geometry structures with minimal violations were selected for further refinement with restrained energy minimization. 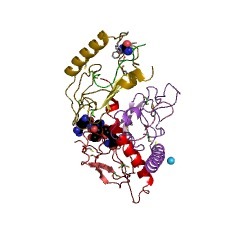 In SDS, at both pHs, the main conformational feature of the hormone is an alpha-helix from Thr6 through Tyr22, thus including the amphipathic 8-22 segment and two residues of the Cys1-Cys7 N-terminal loop. The C-terminal decapeptide forms a loop folded back toward the helix. The biological significance of this conformation is discussed. 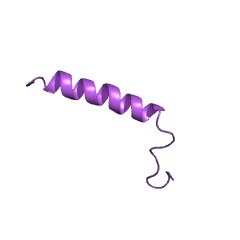 Islet amyloid polypeptide. 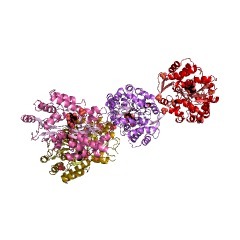 A new beta cell secretory product related to islet amyloid deposits. 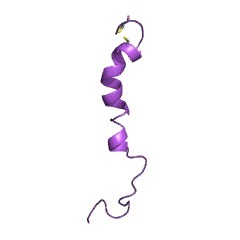 Peptides from the calcitonin genes: molecular genetics, structure and function. This information is based on mapping of SMART genomic protein database to KEGG orthologous groups. 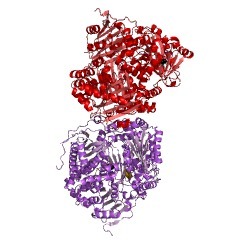 Percentage points are related to the number of proteins with CALCITONIN domain which could be assigned to a KEGG orthologous group, and not all proteins containing CALCITONIN domain. Please note that proteins can be included in multiple pathways, ie. the numbers above will not always add up to 100%. 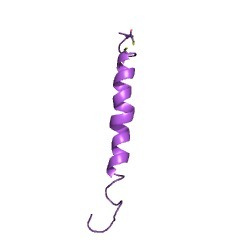 2kb8 The dynamic alpha-helix structure of micelle-bound human amylin.